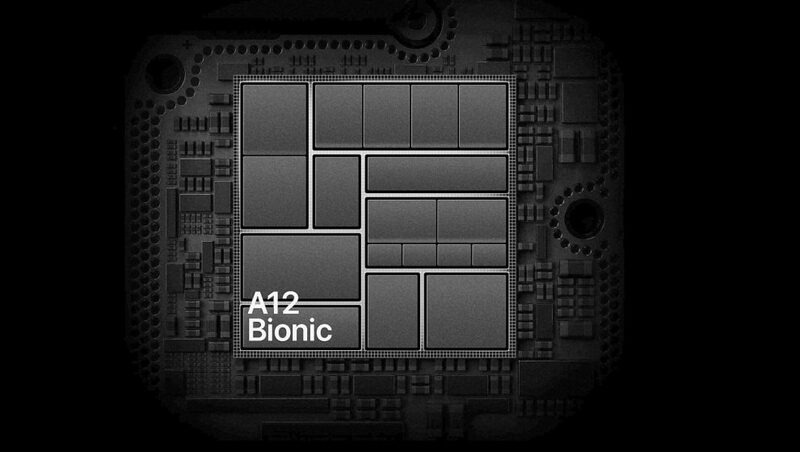 Anandtech a hardware & tech magazine went with thorough benchmarking and examination of Apple’s A12 Bionic Chip, comparing it with the other flagship mobile processors in the market right now. This included its predecessor A11 Bionic Chip as well, Samsung’s Exynos 9810 and 8895, and Snapdragon’s latest 845 & 835 Chipsets. SPEC2006, the benchmark test applied to all of the processors, is claimed to be an “important industry standard benchmark” that uses remarkably larger and more complex datasets than others, far larger than the popular GeekBench 4. The benchmark is assumed to be a better test, due to its potential to offer more details for the microarchitecture in relation to memory subsystem performance. While confirming it to be the 1st time in over 2 years that the publication is using SPEC2006 on an iOS device, it is also stated the figures produced in the tests are just estimates, due to not being submitted or officially validated by SPEC. The benchmark noted the energy usage for a given workload, as well as the performance. Describing it best, the less energy is used and the more performance offered, the better. When compared to the A11, the A12 clocks at 5% higher in the majority of workloads, with a special mention for the SPECint2006 test, which showed a 24% increase. For power efficiency, the A12 marked a 12% improvement on the A11, but with 12% less energy usage at peak performance. Under the SPECfp2006 testing, the average performance gain was 28%, though, under the 433.milc test, this rose to 75%. 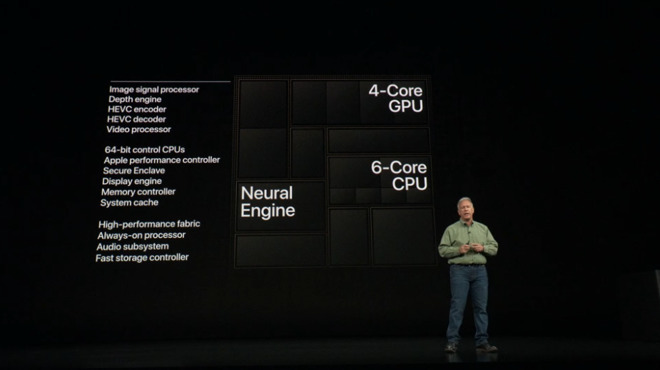 One test, 470.lbm, is said to be interesting for Apple’s chips, as they showcase “multi-factor performance advantages” over ARM and Samsung cores. It is assumed Apple’s microarchitecture is able to optimize by having larger instruction loop buffers, where the core would bypass decode stages in a loop iteration and fetch instructions from the buffer, reducing time significantly. It’s also thought the vector execution of Apple’s cores may be helping it in this test. 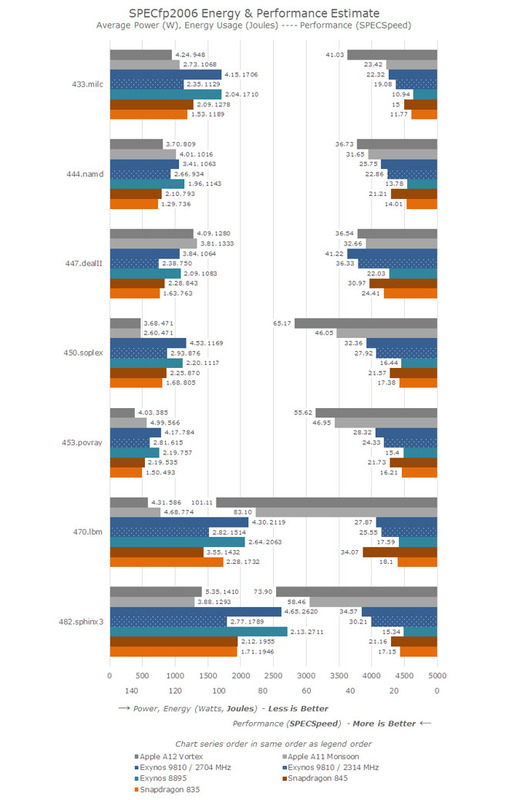 As a consequence of running the SPEC2006 benchmark tests, it has disclosed how close the A11 and A12 are to the performance of desktop processors, with the A12 noted as outperforming a Skylake-based Chip tested a few months ago. Later in the report, the Vortex CPU’s memory subsystem is credited with providing the A12 a significant performance boost in a lot of workloads, adding that Apple’s marketing department is “really underselling the improvements here by quoting 15,” with the site’s estimated improvement for the chip being around 40%. The A12 is a six-core CPU featuring two performance cores, which Apple claims is 15% faster than the A11, while consuming 40% less power. 4 efficiency cores handle lower-intensity tasks, and in theory consume half the energy in comparison to the A11.